Prevent squirrels from overrunning your hanging bird feeders with these Achla Black Hanging Squirrel Baffles. Placing a baffle above your hanging bird feeder often effectively blocks squirrels from reaching it, and this set of two baffles is great for use in two areas of your garden. The generous, 18.25" diameter of each wrought iron piece creates a fantastic shield, and a ring at the top makes each simple to hang. This forms a physical barrier above your feeder, stopping squirrels from reaching it, and a small hook on the interior of the apex holds your birding item easily. The black, powder coated finish remains durable for many seasons, and also protects bird seed from precipitation. Keep marauding squirrels off of two of your hanging bird feeders with these Black Hanging Squirrel Baffles. 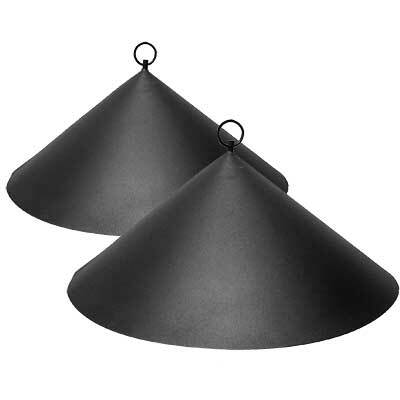 Note: This package contains 2 of the Achla Hanging Squirrel Baffles, Black, 18.25" dia.